Christened the S.S. John Glenn, Cygnus blasted off atop an Atlas V rocket on Tuesday and entered an orbital parking spot to remain out of the way of crew traffic inbound to ISS on Thursday when Russia’s Soyuz MS-04 craft made an express rendezvous to top up the Station’s crew. Cygnus is expected to initiate its rendezvous in the early hours on Saturday to arrive within reach of the Station’s robotic arm at 10:05 UTC for capture that will be followed by the installation of Cygnus on the Earth-facing side of the Unity module. 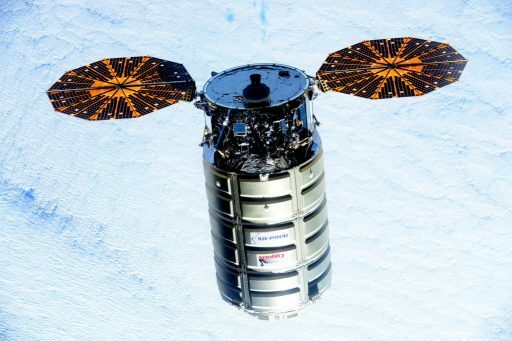 The Cygnus spacecraft is booked for a stay of around three months to facilitate the transfer of nearly 3,500 Kilograms of cargo – including the largest delivery of science equipment ever made by a U.S. Commercial Resupply Craft, supporting dozens of over 200 studies planned on the U.S. Segment this summer. 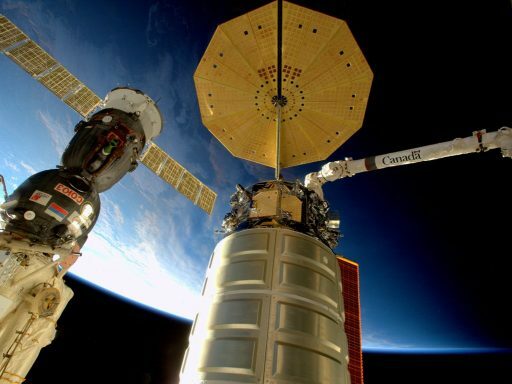 Cygnus is also ferrying a month’s worth of food for the crew as well as other supplies and maintenance hardware, including equipment needed on an upcoming spacewalk to be carried out in mid-May to restore connectivity to an external payload platform and examine the thermal control system of the Alpha Magnetic Spectrometer 2. 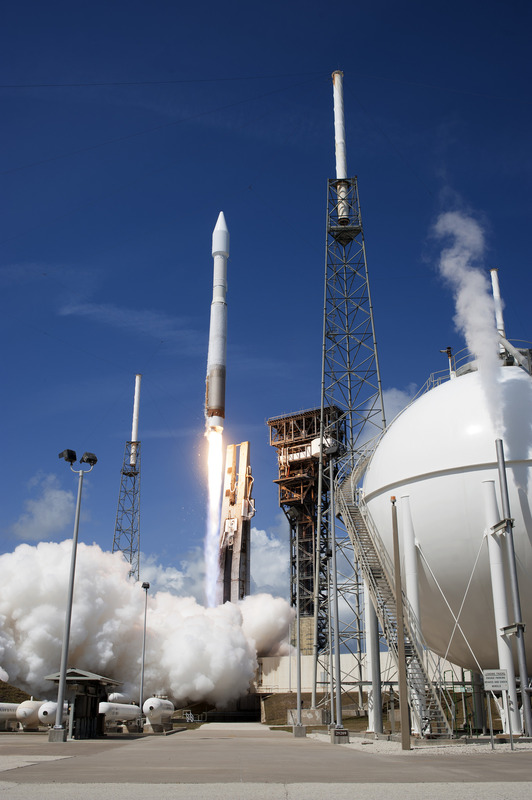 The seventh operational Cygnus spacecraft blasted off from Cape Canaveral at 15:11 UTC on Tuesday, enjoying a smooth 21-minute ride into orbit atop the Atlas V rocket before springs pushed the spacecraft on its way. 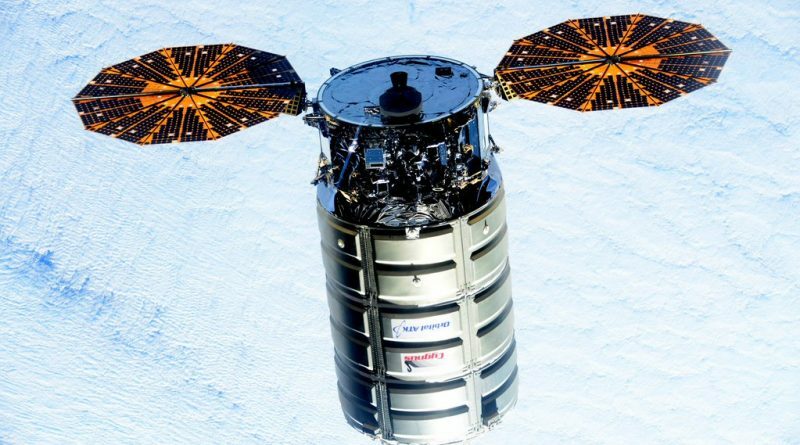 Cygnus started out in an orbit of around 234 by 237 Kilometers, according to tracking data from late Tuesday. From there, the spacecraft was set to ascend to meet up with ISS in its current 400 by 410-Kilometer orbit. The spacecraft unfurled its two circular solar arrays two hours into the mission and several hours of checkouts were completed by Mission Control teams in Dulles, Virginia before Cygnus was given instructions to fire up its 450-Newton DVE main engine. Within 24 hours of liftoff, Cygnus had maneuvered into a 398 by 412-Kilometer orbit where it was trailing ISS at a distance of approximately 2,500 Kilometers. Cygnus remained in this orbital parking slot on Thursday, keeping the way clear for the Soyuz MS-04 spacecraft that lifted off from Kazakhstan atop a Soyuz FG rocket and executed an expedited rendezvous, chasing ISS down from behind and below in just six hours to deliver space veteran Fyodor Yurchikhin and first-time flier Jack Fischer to their home in space for the next four and a half months. Cygnus lowered its orbit to 387 by 402 Kilometers, flying roughly ten Kilometers lower than ISS to begin the process of catching up with the Station for Saturday’s multi-hour rendezvous sequence. Approaching from behind and below, Cygnus will pass its Joint Targeting Reference Point just before 7 UTC, marking the start of integrated operations between Mission Control Dulles and MCC Houston which holds the overall authority over the day’s operation while Dulles is in charge of advising on Cygnus status and sending commands to the spacecraft. Once Cygnus is inside 28 Kilometers, the rendezvous will switch to relative navigation mode in which GPS information from ISS is sent to Cygnus and compared with the spacecraft’s own GPS readings to provide an accurate representation of the geometry between the two orbiting craft with much higher precision than using absolute GPS. 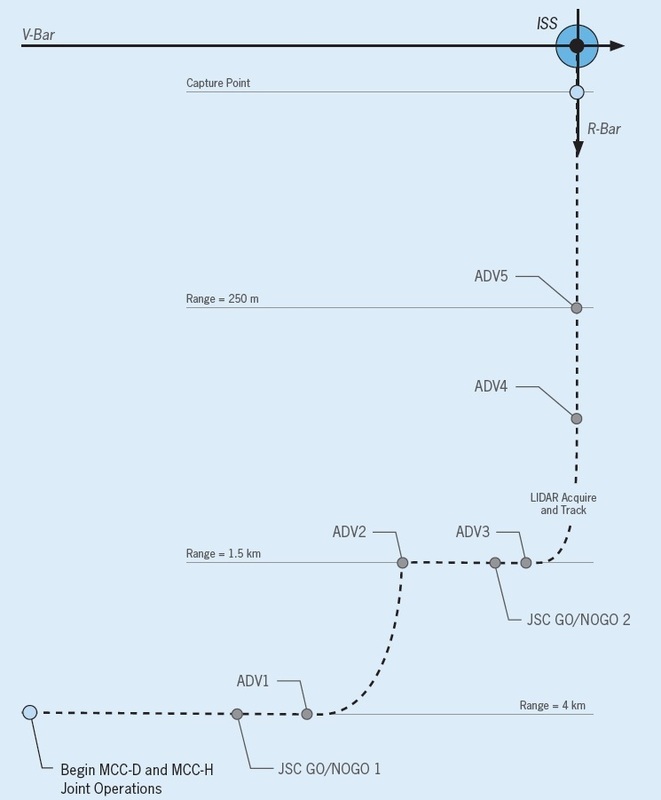 Relative GPS data will guide Cygnus through three ADV (Approach Delta-V) maneuvers before the craft’s optical navigation sensors take over for Proximity Operations. The first ADV burn of the BT-4 main engine comes around 7:20 UTC to begin the transition from an orbit four Kilometers below that of ISS. A circularization burn (ADV2) occurs half and orbit later and Cygnus will continue approaching ISS from an orbit 1.4 Kilometers beneath that of the complex. With Cygnus closing in on the Station, the U.S. Segment crew members will begin preparing for the craft’s arrival at ISS. 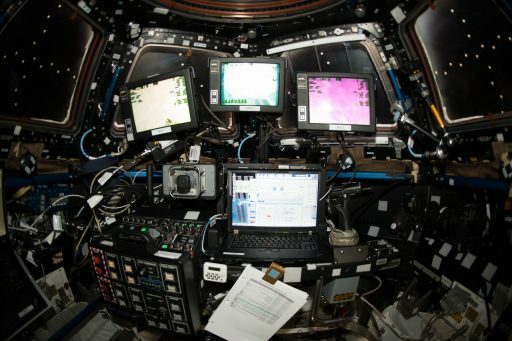 Setting up shop inside the Cupola will be ESA Astronaut Thomas Pesquet who will be the primary robotics operator on Saturday backed up by Peggy Whitson who will handle communications with Mission Control and operate the Hardware Command Panel that allows the ISS to directly send commands to the Cygnus through a space-to-space communications link. A poll will be completed at Mission Control ahead of the Approach Initiation Burn (ADV3) around 8:40 UTC that will put Cygnus from a position behind ISS on a path toward the R-Bar – an imaginary line connecting ISS and the Center of Earth. Once acquiring the R-Bar, around 350 meters directly below ISS, Cygnus will fire up its TRIDAR optical navigation System. TRIDAR employs a laser-based 3D sensor to capture the three-dimensional signature of its target that is then put through a software algorithm comparing the data with the known shape of the target spacecraft to calculate the six-degree-of-freedom geometry between Cygnus and ISS. Approach Burn 4 takes place when Cygnus arrives at the R-Bar to enable the spacecraft to make a straight-up approach to the Station. Reaching the 250-meter mark around 9 UTC, Cygnus will pause its approach for a checkout of its Proximity Navigation System before teams will be polled for a Go to resume the approach from 250 meters. Gently firing its thrusters, Cygnus will initiate a closing rate and enter the Keep Out Sphere, an imaginary 200-meter zone around ISS in which the highest safety standards have to be met by visiting vehicles. As Cygnus enters the KOS, the Station crew will be instructed to send abort commands in case the vehicle ventures outside its pyramidal approach corridor while ISS is out of contact with Houston. At a range of 55 meters, good TriDAR navigation is verified and at 30 meters, Cygnus enters its next hold – expected to last ten minutes. When the hold is complete and all teams provide approval, Cygnus begins its final approach to the Capture Point – 10 meters from ISS, within the reach of Canadarm2. The transition to the capture point takes about 20 minutes and Cygnus is expected to enter its Capture Hold at 10 UTC (earliest Capture point arrival). 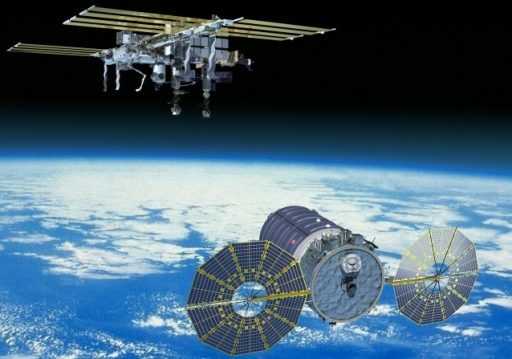 As soon as Cygnus arrives at the Capture Point, within the SSRMS capture volume, it will zero-out any relative motion between itself and ISS. Final reviews will be conducted on the ground before the GO is given for the capture, allowing the ISS crew to move through their last preparatory steps at their own pace. ISS will enter a fine attitude hold for the capture sequence while Cygnus will be commanded into free drift in the last moments before capture, disabling all thrusters before the robotic arm makes contact with the spacecraft. The SSRMS Video & Data Grapple Fixture is located on the aft end of Cygnus. The crew will align the End Effector of Canadarm2 with the grapple fixture before starting the capture sequence, placing the End Effector over the grapple fixture and initiating snares to close in order to capture the spacecraft. Because there is some wiggle room in the timeline for Cygnus’ rendezvous, an exact time for the capture can not be given. With Cygnus firmly grasped by the robotic arm, the crew will hand robotics off to the team on the ground for the berthing operation that begins with a series of safing steps on the Cygnus spacecraft before the arm will execute a set of maneuvers to bring the spacecraft into its pre-berthing position for a survey of the Common Berthing Mechanism to verify the redundant pressure seals are intact and there are no foreign objects that could interfere with the berthing. ROBO controllers will rely on the Centerline Berthing Camera System to position Cygnus with millimeter-accuracy before capture latches are closed within the nadir Common Berthing Mechanism of the Unity module. Once first stage capture is achieved, the SSRMS will be transitioned into limp-mode to give Cygnus some wiggle room to be pulled into the CBM when bolts drive. Second stage capture is achieved by driving sixteen bolts in four sets of four, forming a firm structural connection between ISS and Cygnus and tightly pulling the double-redundant pressure seals within the berthing mechanism together. After each of the bolts is loaded with a specific torque, Mission Control will clear the crew to press into the lengthy vestibule outfitting and hatch opening task. This procedure entails an hour-long pressure check on the vestibule between Cygnus and Unity before the first hatch is opened to give the crew access for the installation of data/power jumpers and ventilation ducts and the removal of the Controller Panel Assemblies that are responsible for driving the CBM bolts. After that, the crew will be ready to open the Cygnus hatch which may occur as early as Saturday evening depending on the overall progress of the day’s events. Cygnus is currently looking at a stay until July to facilitate the transfer of supplies before the spacecraft embarks on a free flight to deploy four Lemur-2 CubeSats and perform the SAFFIRE-III in-space fire experiment ahead of ending the mission via destructive re-entry.